Overall environment and experience good but I had to step out side of the room twice to call the doctor afterwaiting over 45 min in the room. Overall environment and experience good but I had to step out side of the room twice to call the doctor after waiting over 45 min in the room. 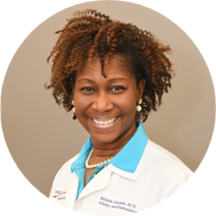 Dr. Belinda Graham is an allergist caring for the Smyrna, GA community. Dr. Belinda Graham received her bachelor’s degree in biology from the University of Alabama at Birmingham. She received her medical degree from Meharry Medical College in Nashville, Tenn., (where she also completed her internal medicine residency.) Dr. Graham completed her allergy, asthma and immunology fellowship with Children’s Mercy Hospital and Clinics in Kanas City, Mo. Dr. Graham is board certified in internal medicine and allergy and immunology. She is a member of the American Academy of Allergy, Asthma and Immunology, American College of Allergy, Asthma and Immunology. Dr. Graham currently is in practice with WellStar Allergy & Asthma. She was vey informative and asked a lot of questions to get an understanding of what was going on! Customer service was great and staff was very friendly and polite!